Purple Crystals may help to balance energies, calm mental processes, enhance meditation, and release feelings of anger, fear, and anxiety. Lovely with a super smooth polished surface, dark purple and white banded Chevron Amethyst Tumbled Quartz Crystals from Brazil. 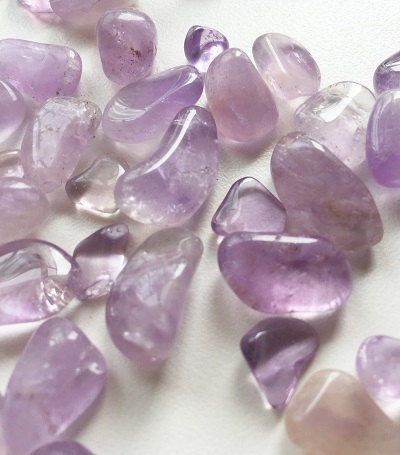 Beautiful lavender purple colored smaller sized Amethyst tumbled stones from Bolivia. Stunning grape purple colored Lepidolite in Pegmatite from Zambia, Africa. Beautiful, lilac purple natural Fluorite crystal from Riemvasmaak, South Africa. Purple with golden hues, these Ametrine tumbled quartz crystals have rainbows and reflective interior veils. Natural dark grape purple colored Fluorite crystal with a flashy rainbow on a beautiful snowy white Quartz crystal matrix from Mexico. This stunning crystal specimen combines the energies of Purple Fluorite and amplifies them with the presence of the Quartz Crystal. Gorgeous lilac Natural Stichtite cobbed material from Barbeton, Mpumalanga, South Africa. Rainbow Fluorite Crystal Skull carving with a beautiful colorful blend of dark purple, blues, greens and white. Grape purple colored carved agate owl totem beads. Stunning rainbow Fluorite crystal chip bracelet strung on 6 inch elastic cord with a beautiful colorful blend of purples, blues, and greens. Vibrant shades of purple Amethyst Crystal chip bracelet strung on a 6 inch elastic cord from Africa. Lovely dark violet with speckles of black manganese tumbled Charoite crystals from Russia. Beautiful dark grape purple colored Natural Amethyst Quartz Crystal Cluster from Uruguay. Stunning rainbow Fluorite tumbled stones with a beautiful colorful blend of purples and greens. These rough Amethyst Quartz Crystal Points from Brazil are great crystal tools for clearing the energies of a healing space or for your personal environment and living areas. Reflective natural purple-red colored Lepidolite with mica from Brazil.